See European Car Magazine's review of the this tire HERE. Azenis PT722 is Falken's first ultra high performance, all-season tire, with a deep tread depth and long lateral groove, for anti-hydroplaning and stability in the wet. The asymmetric tread pattern provides tremendous comfort while Falken�s Treadwear Indicators regularly inform drivers of proper rotation timing, thus maximizing wear performance for better mileage and longer life. NEWLY DEVELOPED WIDE STEEL BELTS that are stronger than normal cord, offer better wear and performance. UNIQUE RIB GROOVE inhibits irregular wear by enahancing rigidity of the tread. DEEP TREAD DEPTH improves mileage and increases longevity. JOINTLESS NYLON CAP PLY & LAYER increase durability at speed and in wet conditions. HIGH DENSITY CASING PLY improves wear resistance. TREADWEAR INDICATORS regularly informs drivers of proper rotation timing. 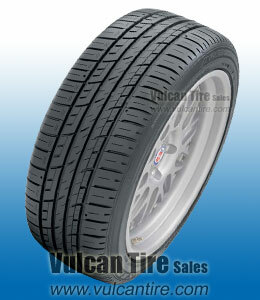 This tire is also available in additional sizes, click here for more tire sizes. Put tires on just before an average winter and really didn't have any problems with the tires. Held pressure evenly through the coldest part of the year!! Handled well and have worn very evenly! Love the looks. Rides pretty well. Seems to wear much better than stock tires. The tire are good so far.